As I approached the third hour of sitting in the waiting room of the tire dealer waiting for a very simple service – take my snow tires that YOU store for me, put them on my car after you remove the summer tires and put them in storage – I began thinking about customer service. I watched a dozen people come in after me who were lucky enough to have a ride home or to their office and therefore didn’t have to wait in that god-forsaken waiting room. One person who popped in while I was writing this sentence asked “how long” and was told no more than two hours – then went off to their warm home. At that moment, I was at 2:03 and counting. 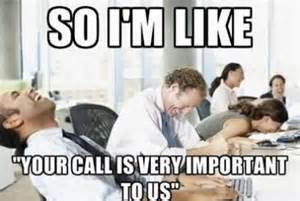 If I ran the world, there would be rules for customer service. One would be if you have taken the time to COME IN to a business you get preference over someone on the phone. There is nothing more annoying than standing at a counter discussing whatever it is you are there to buy and having the person interrupt you, answer the phone and then stay on the phone to help THAT person first. If you are truly the only one who can pick up the phone, answer it, put that person on hold until you have finished with me. That should be one privilege of being there in person. At a bank, if you walk in the door, you get first service over drive up customers. How many times have you waited in a long line while a teller takes care of one drive through customer after another? If you can’t dedicate one teller to the drive through line, have a protocol that takes care of your in-person customers first – or at the very least on an every-other-customer basis (one drive through, one in line). And finally and most important to my situation at the tire dealer, if a business does not take appointments – like this one – if I come in and wait for you to finish my service instead of dropping off and going back home, I get moved to the front of the line. And my car is certainly taken care of before anyone who comes in after me and demands “when will it be done” and then leaves to go back home. No question about it. Oh and here’s one for being a bad customer. If you approach the counter of Starbucks, or any retailer, with a phone stuck to your ear and tell the person trying to wait on you – to wait. Get out. Finish your call. Come back when your brain is halfway engaged. If only I ran the world…..